The X-wing was originally designed by Incom Corporation for the Empire, but the entire engineering team defected to the Rebel Alliance with the prototypes hidden on Fresia. It was directly descended from the old Z-95 Headhunter, built by Incom and Subpro, with lessons learned from the ARC-170 starfighter. After 4 prototypes were extracted from Fresia during the Battle of Fresia, it first encountered Imperial forces in the Battle of Turkana. 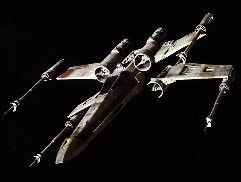 The X-Wing was the main strike fighter for the Rebel Alliance, and with various modifications fulfilled that role long after the formation of the New Republic. A potent combination of manueverability, endurance and firepower made it the weapon of choice for most Rebel pilots.